More than 1,200 abstracts from 85 countries around the world have been reported for this AGROSYM edition. The main thematic areas to be focused on “AGROSYM 2018” are: Plant Production, Plant Protection and Food Safety, Organic Agriculture, Environmental Protection and Natural Resources Management, Livestock Production, Rural Development and Agroeconomics, Forestry and Agro-forestry. AGROSYM is, since nine years, an annual platform for international scientific discussion on agriculture, food, rural development, environment and forestry. AGROSYM represents a good opportunity to exchange ideas, to strengthen existing and to create new academic networks, and to foster dialogue between the academia, public institutions, the private sector and civil society organizations on the recent global and regional trends in the agro-food sector. AGROSYM covers the following thematic areas: plant production, plant protection and food safety, organic agriculture, environment protection and natural resources management, animal husbandry, rural development and agro-economy, and forestry and agroforestry. Multidisciplinary results reported during AGROSYM will contribute to the dissemination of knowledge and good practices to all actors of the agro-food chain (e.g. farmers, extension agents, researchers, policy makers) as well as the general public about the importance of agriculture and food science, one of the most important strategic areas of many national research strategies. It is important to emphasize that the scientific committee is made up of scientists from all continents, giving this Symposium strong international seal and scientific credibility. 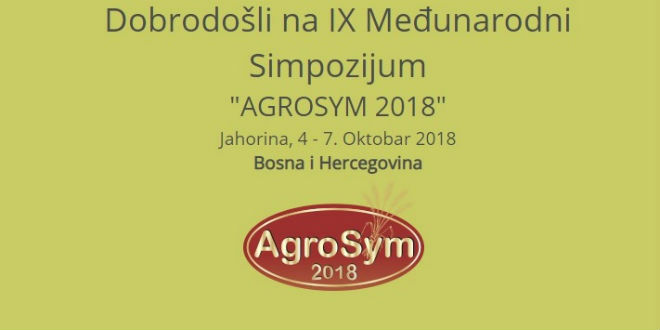 The organizers of the International Agricultural Symposium “AGROSYM 2018” are the University of East Sarajevo – Faculty of Agriculture, University of Belgrade, Faculty of Agriculture and the Mediterranean Agronomy Institute in Bari (CIHEAM – IAMB) Italy in cooperation with numerous universities, associations, centers and institutes from all over the world. Last year, “AGROSYM 2017” was visited by more than 1200 participants and more than 1300 papers from 85 countries were presented. For more information visit the official website of the IX International Agricultural Symposium “AGROSYM 2018”.